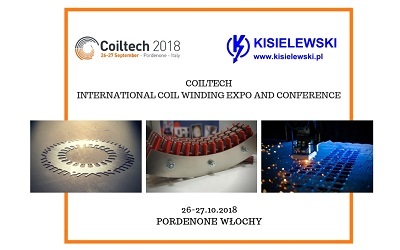 Coiltech International Coil Winding Expo and Conference – annual trade fair held on Pordenone in Italy. The event is focused on materials, machinery and equipment for the production and the maintenance of electric motors, generators, and alternators as well as power distribution, industrial transformers, and coils in general. Our experts take part in the exhibition to promote components which are manufactured and designed by KISIELEWSKI company.